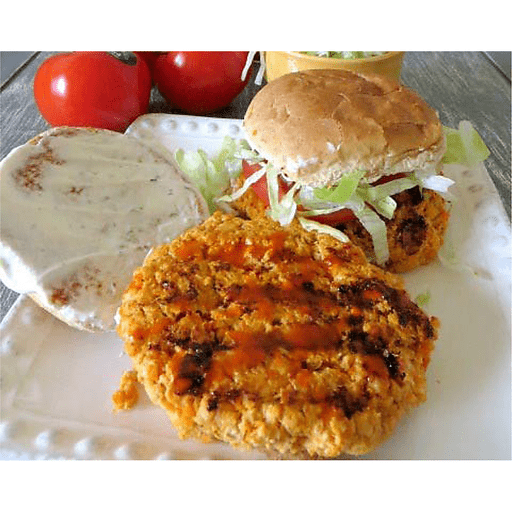 In these Buffalo Ranch Turkey Burgers, the sizzling bite of buffalo sauce brings the ground turkey burger to life, while a homemade ranch “dressing” provides the creamy cool down typically provided by a higher calorie cousin, blue cheese dressing. They also have cooked carrot and onion on the inside, keeping the burger moist while boosting nutrients! 1. Heat canola oil in a skillet over medium-high heat. Meanwhile, combine ranch dressing mix packet to Greek yogurt and mix well. Place in refrigerator to cool. 1. When oil is hot, add carrots and onion and cook until soft, about five minutes. Add garlic and cook for an additional 30 seconds. Place carrot mixture in a large bowl to cool, about ten minutes. 1. Add poultry seasoning, ground turkey breast, and buffalo sauce to carrot mixture. Mix until well combined. Form into patties and refrigerate for 30 minutes. 1. Place turkey patties on grill or cook on stovetop until cooked through to 165°F. Spread prepared ranch dressing on top of buns and place burgers on buns. Serve with desired toppings. For gluten free: Use gluten free buns instead of whole wheat. Calories 420, Total Fat 16g (Saturated 3.5g, Trans 0g), Cholesterol 90mg, Sodium 1490mg, Total Carbohydrate 35g (Dietary Fiber 1g, Sugars 9g, Includes 0g Added Sugars), Protein 37g, Vitamin D 0%, Calcium 15%, Iron 15%, Potassium 15% *Nutritional values are an approximation. Actual nutritional values may vary due to preparation techniques, variations related to suppliers, regional and seasonal differences, or rounding.